More than 150 books on various subjects. A man with Intuitive Sight and Effective Non-Voilent Actions, Striving for Universal and Amity. The Meaning of Mahaprajna (spoken: Mahapragya) is "Highly knowledgeable". Acharya Mahapragyaji - often described as "A Living Legend" is not merely a person but also a purpose, not just a being but also a belief. He is that perception that cannot be bound by time or territory. Thought’s churned out from the depths of his meditation are lasting and effective. He dispelled many myths about the religion and its rites and rituals. He said, "The religion which does not bring about a change in man’s life, which does not impart peace to him, deserves to be thrown in the river Ganges rather than carried on as a burden on one’s shoulders. Rituals or idol worship alone are not enough unless one’s conduct also gets transformed. Unless one is righteous and honest, both to himself and others, and leads a value oriented life, he is not religious despite his proclamation". He is an erudite scholar of Jain Agamas , a reputed critic of Indian and western philosophy, a coordinator of science and spiritualism and a sincere disciple of Acharya Tulsiji.His outstanding intelligence is a matter of surprise even for the intelligentsia. He is a treasure house of infinite knowledge . This is why he is popularly known as a ‘mobile encyclopaedia’. The eminent poet Ramdhari Singh Dinkar used to designate him as the ‘second Vivekananda of India’. While adding lustre, prestige and glow to the ‘Terapanth’ sect he has also served as a beacon of human mind engulfed in countless problems. His experiments on Preksha Dhyana (Perceptive meditation) and ‘Jeevan Vigyan’ (Science of Living) have succeeded in bringing people of different religions sect or castes on one platform and to integrate the west with the east. Besides being a philosopher-thinker lost in philosophy he is also a sensitive poet. His verses both in Hindi and Sanskrit , reveal his subtle delicate feelings. As a poet , it is difficult to categorise him into a type. Is he a poet of torrential waves of ecstasy or renunciation , a singer of the nature’s beauty or its monstrosity or of the man in clutches of machine, mechanization or machinations nobody can tell. Sambodhi, Ashruvina, Mukulam (in Sanskrit) and Rishabhayana (in Hindi) are some of the literary jewels contributed by him to the world of literature. This noble soul and great thinker was born in 1921 at Tamkor , a medium village in the Jhunjhunu district of Rajasthan (India) . At the tender age of 10 years he became a monk . Under the able guidance of Acharay Shree Tulsi , he got his education and proved himself as an ardent disciple. A study of History , Philosophy , Logic, Grammar etc. made the foundations of his knowledge strong and secure. He also made an in-depth study of Modern Physics and Bio-Ssciences, Ayurved ( Indian system of medicine) Politics, Economics, and Sociology with the modern trends of communism, socialism and capitalism. 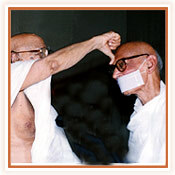 He became a leader of all the senior and talented saints of Jainism. On several occasions he was honored in recognition of his extraordinary scholarship and outstanding contribution in organizational affairs. At the age of 59 he was appointed the successor - designated by Acharya Shree Tulsi. 1.Nikaya Sachiva (Chief Secretary of Terapanth). Acharya Shri Tulsi nominated him (Muni Nath Mal) as the Nikaya Sachiva of Terapanth in 1965 at Hissar, (Haryana). 2.Mahaprajna ( A Great Seer). Acharya Shri Tulsi conferred on him the epithet of "Mahaprajna " (A Great Seer) in recognition of his outstanding wisdom and erudition in 1978 at Gangasahar, (Rajasthan). 3. Nomination as " Successor-designate"(Yuvacharya). Acharya Shri Tulsi nominated him (Muni Nath Mal) as his successor- designate (Yuvacharya) on 4th February 1979, at Rajaldesar, (Rajasthan) and changed his name to "Mahaprajna" .Then onwards he became known as "Yuvacharya Mahaprajna"
4. Jain-Yoga-Punruddharak (Resurrector of Jain Yoga). Acharya Shri Tulsi conferred on him the epithet of "Jain-Yoga- Punaruddharaka" in recognition of his unique researches in the field of Jain Meditation and Yoga.